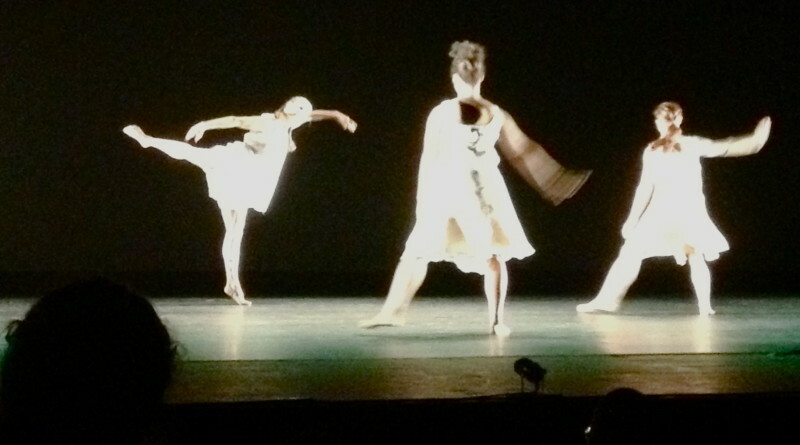 Jane Comfort & Company performers dance "Underground River." Photo by Victoria Stitt/The Daily Gazette. The restrictive element of achieving perfection is hyperbolically exemplified in the very first piece of Jane Comfort & Company’s production, “Beauty,” when the dancers try to dance within the confines of a Barbie doll body. As a modern dance composition, the piece would be free from the confinements of other genres of dance, but when modern is put into the body of a Barbie, it loses its modern identity. It is this paradox that Jane Comfort & Company uses to challenge conformity in their production. “Beauty” centers on women’s struggle with achieving “perfection.” Although such a topic has been challenged many times before and could be deemed as overdone, “Beauty” was unique in its portrayal. While most attempts to demonstrate consumerism are physically performed, “Beauty” also exemplifies the mentality of a woman trying to become the society-based definition of a perfect woman. Scenes in which women eat stuffed tissues and cotton balls viscerally symbolize the absurdity of many women’s material consumption as a means to achieve the ideal image. says Leslie Cujeyt, or Barbie No. 4 as she is referred to during mock beauty pageant portions of the piece, shortly after she takes out her hair and undoes her fake extensions. She dances freely, not limited by a Barbie body but released into her style of dance. Despite this apparent freedom to be an “ugly pretty girl” by showing ambition and an attitude, she still looks at her body with discontent; her confidence is always vulnerable and her body is always regarded with some type of scrutiny. The extremity of compromising oneself to fit into a formula is strikingly displayed when a woman goes to a male doctor to “revamp” her body. The doctor circles each thing on her body that she wishes to change, from breast implants to thigh reduction, which is done with the intention that she’ll leave surgery more confident and more content with her body image. There were points when the dancers stood at the edge of the stage for long periods of time, presenting their bodies in minimal clothing, and the audience was manipulated into a position of judgment. The audience noticed the “flaws” in each dancer’s body because they were not ideal bodies. However, because the audience was challenged, it recognized the beauty in each woman and that no one can attain an “ideal” body. When “Beauty” came to a close, the audience was made to openly scrutinize the women by voting for Barbie 1, 2, 3, or 4. Although most voting cards read “all” or “none,” a Barbie was in fact chosen. Three Barbies took out their fake hair, slipped into what seemed to be their street-clothes, and walked off stage, while the winning Barbie came forth and stiffly waved and smiled at an audience that simply watched. Students participate in a workshop held by Jane Comfort & Company on Saturday. Photo by Elena Ruyter/The Daily Gazette. The second piece in the production, titled “Underground River,” unfolded against a light blue backdrop with light dancing, forming an aura of peace. It opened with the four performers dressed in white and dancing playfully, but the mood soon shifted dramatically. A voice from the speakers repeated, “Kara,” which was soon identified as belonging to the mother of a young woman or girl in a hospital. The woman’s voice quaked and faltered, and soon was accompanied by what the audience could only assume to be the voice of Kara’s father. 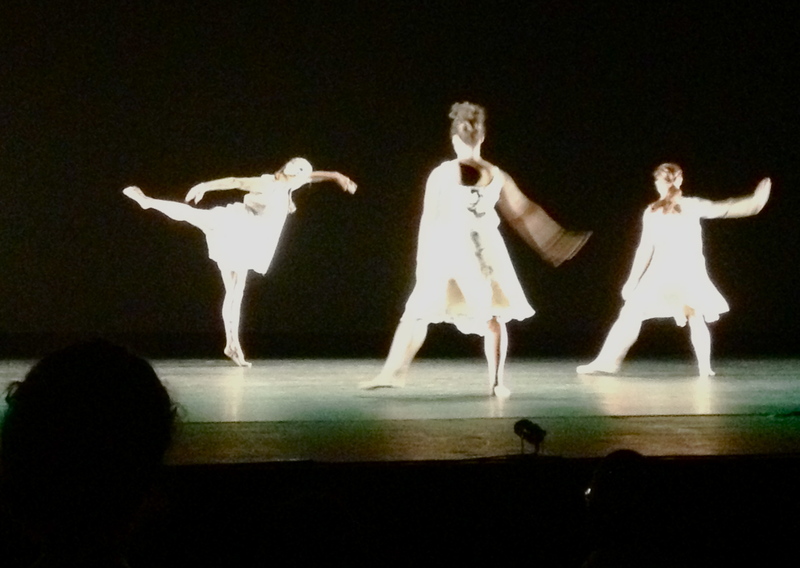 The dancers looked around in space for the voices, but soon returned to their natural form of modern movement. The dancers’ role in relation to “Kara” was at first unclear. They seemed to be something apart from Kara, but soon it was apparent that the dancers represented Kara’s nervous system, muscles, and/or other mental and physical bodily functions. As the voice of a doctor would ask “Kara” to move her legs or squeeze her hand, the dancers would perform an act more physically trying. Dancers would carry one another on each others’ backs or across their bodies to demonstrate the simple act of moving a leg or even blinking. As the dance progressed, the performers found it easier to ignore the voice. It was more appealing to dance freely and play with one another, without thought or care. The voices grew more concerned, and, eventually, further away. As the voices faded, I was positioned between feelings of loss and wanting to allow the dancers to simply dance. Allowing paralysis or death of movement was made beautiful, for movement could now flow without the interruption of a command. Overall, the two pieces evoked feelings of discomfort. As modern dance often does, the performance pushed boundaries of traditional dance. However, if you entered Lang with expectations of being inspired by dance, you weren’t going to leave quite satisfied by the technique. Both “Beauty” and “Underground River” were more like performance art. The actual movement wasn’t particularly astonishing. The juxtaposition of these two extremely different pieces exemplified the wide range of usages that the modern genre of dance can adopt. From challenging societal norms to portraying something abstract, Jane Comfort & Company’s production used modern dance as a vessel to say things that are more beautifully said through movement.